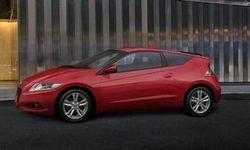 AutomotiveNews.com reports that Honda is trying to push the limits of what a hybrid vehicle can be. The company’s new CR-Z is a sporty two-seater on August 24 for less than $20,000, creating a potentially attractive option for new car buyers looking for a fun and sporty hybrid alternative without breaking the bank. Honda has been able to keep the costs down on the CR-Z by integrating the engine and the bulk of the Integrated Motor Assist system from its Insight hybrid hatchback. The car is available with either a six-speed manual or continuously variable automatic transmission option. The performance has been enhanced with several featured. Honda made the car as light as possible by reducing weight in various areas, including the 16-inch wheels and forged aluminum front suspension parts. Drivers can also toggle between a “sport” and “eco” mode to increase power or fuel efficiency.